This twist on the classic grilled cheese, with its sharp, crispy texture, is one that cheese lovers are sure to enjoy. Heat a non-stick pan over medium-low heat. Butter each slice of bread. Place two slices of bread in the pan, buttered-side down. Place two slices of cheddar cheese on one slice of the bread and cover it with the other slice of bread. 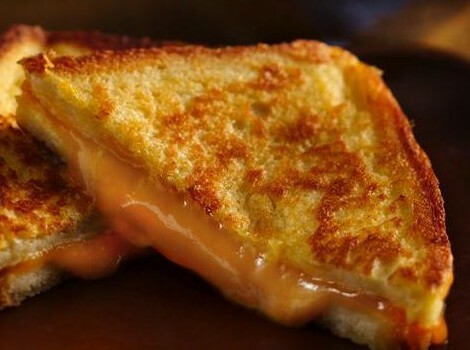 You will now have a regular looking grilled cheese sandwich. Sprinkle one tablespoon of the grated parmesan on the top slice of bread and flip the sandwich so that the parmesan cheese toasts and the cheddar begins to melt. In the meantime, sprinkle the remaining parmesan on the second slice of bread. After the first side has toasted to a crispy golden brown, flip and toast the second side. Cut sandwich in half diagonally and serve with a bowl of tomato soup.